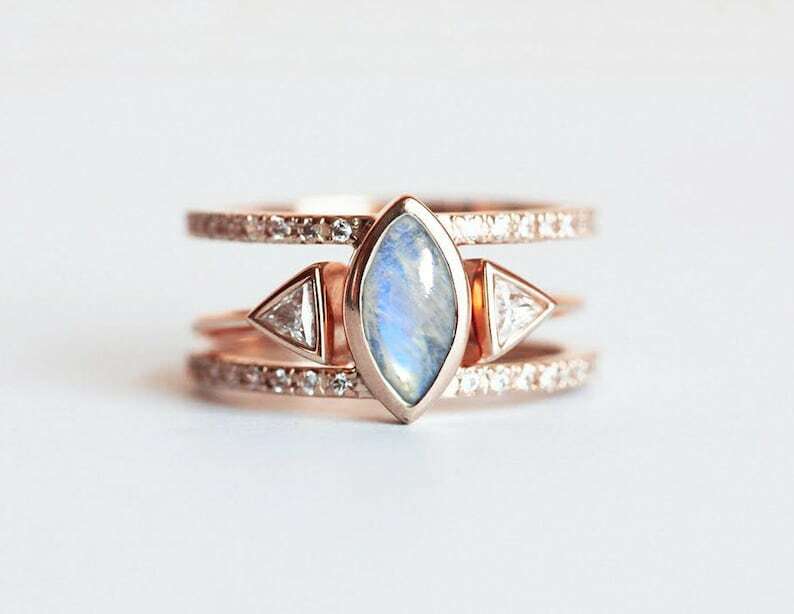 A spectacular stacking moonstone and diamond set! 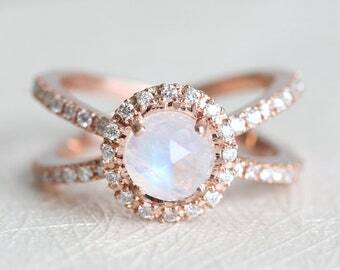 These rings can be worn together or separate. 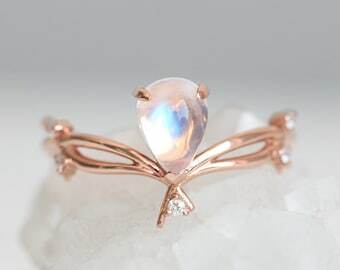 Please select the type of stone and ring size from the drop-down menu on the right side of the listing and leave us a note with the desired material in the notes after purchasing or send us a message. I’m in love with my ring!! Pictures really don’t do it justice. The timing provided was spot on. I maybe even received it a day or two early. So happy with this purchase!! All I can say I WOW we were blown away with the ring!!! And their response time as well as schedule for delivery was perfect and prompt the whole way through. I'd recommend them to anyone. 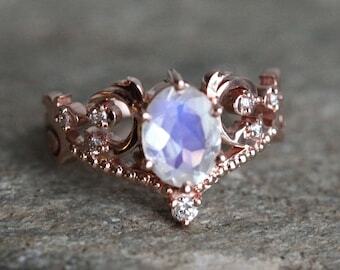 I can't even begin to express how in love I am with this ring. The picture really does not do it justice. Absolutely stunning! We accept payments via PayPal and via direct checkout with a credit card. CAPUCINNE™ offers a 5 day money-back guarantee or exchange on all purchases, excluding items that are custom-made, ooak (one of a kind), personalized, rushed, discounted, and items on payment/financing plans. All items returned must be in new/unused condition with all original documents and packaging. Prior to sending the package back, contact us for information on how to ship the item back. We cannot be responsible for an item not returned in the manner described. We are not responsible for loss or damage of return shipments. If the item was damaged in anyway, you will be charged for the damages. The item must be returned in its original packaging and along with all the original documentation. All discounted, rushed, ooak, layaway/financed, personalized or custom orders are non-refundable; this includes partial payments. We reserve the right to refuse returned items we deem as not in a sellable condition (damaged, altered, or used). If you provided us with the incorrect size and want to resize it, there are additional costs for the resize and shipping both ways. Please contact us with your issue with our item and we will provide you with further instructions. 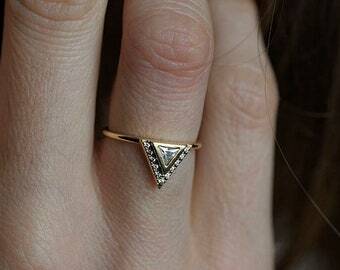 We do not offer refunds if the size of the ring you have provided is not correct. 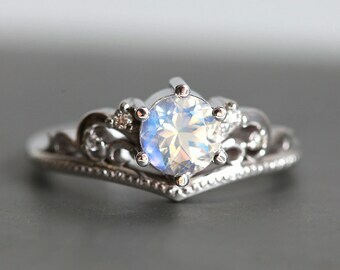 Any changes to the items (ring resizing, soldering, exchanging stones, pendants, etc.) voids the warranty. We offer three free 3D previews. An additional preview after that is 50$. The additional preview fee will be subtracted from the order. Upon receiving the package, we will inspect the returned item(s), original documentations, and packaging. If everything is in order, we will issue you a full refund. Please have in mind that shipping costs cannot be refunded. •	We will put your piece into production once the payment is received. •	The production usually takes approx. 10-20 business days. Some items may acquire more days to be finished, depending on the availability of stones and complexity of the design. •	If sending as a gift, please provide us with the address of the recipient and with your personal message to the recipient. We will send it directly to them with a gift card and wrapping. All items are handmade. Every piece has to be 3D designed, wax printed, cast, brushed and polished. Additional tasks may include the insertion of gemstones, engraving etc. Avoid contact with water. 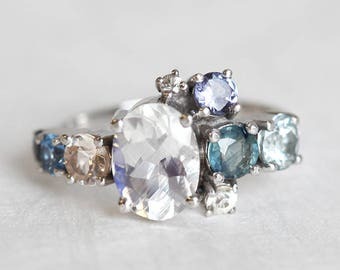 Please remove jewelry before washing hands, swimming or applying body care products such as perfume, soaps etc., since this could harm the metals and reduce the lifetime of the plating. Avoid hard contact such as knocking against objects which could cause scratches, chips and other damage. Customer satisfaction is our number one priority. Please contact us if you have any questions or feedback. We use standard US ring sizing but can help you confirm the right size in any other measuring scale (UK, Australian, European). You can also provide us the inside diameter of a current ring in millimeters and we will be converting it to a US sizing. When estimating a correct ring size, it is best to consult with your local jeweler. 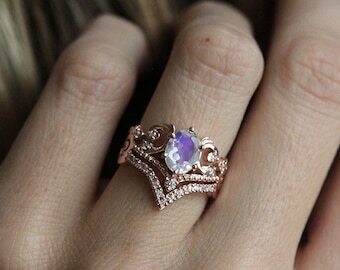 If this is not feasible, try findmyringsize.com to use a manual ring sizing guide to help figure out your size. *Please note this is only a guide therefore we cannot be responsible for incorrect ring size determination. We are always open to collaborating on a completely unique and custom design of any kind. 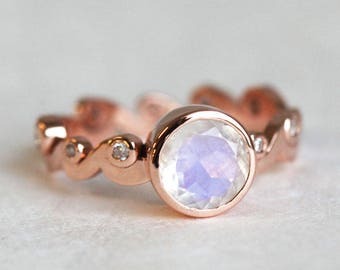 We offer custom fit stacking rings, custom stones, material customizations or entirely custom designs. In case you would like to customize an existing design or create an entirely unique piece, please contact us on Etsy convo. In case of a customized design, additional fees may apply. Please check our shop policy on further information about custom designed pieces. All of our pieces are made to order. Our pieces take from 2 - 3 weeks to be finished. In times of a higher order number (Valentine's day, Christmas time and similar) the production time can be slightly longer. Please plan to order accordingly. Production time depends on the amount of stones on stock, in case of a custom design the production time is a bit longer. In case you need to receive your order by a specific date, please contact us beforehand on Etsy. We're always happy to rush an order to make sure it arrives on time. All of our items are shipped with an express shipping service. Delivery takes from 1 - 5 days, depending on your location. We ship all of our orders from our studio in Europe, Slovenia. We offer the possibility to pay in multiple partial payments, that way you can purchase an item in a pace most comfortable to you. If you would like to purchase an item in more installments, please contact us on Etsy beforehand. Your order is shipped as soon as the last installment is paid. Each item comes in a Capucinne gift jewellery box, a high quality presentation box and a perfect box to keep your jewellery while you're not wearing it. If you would like us to include a gift note in the parcel, please leave us a message with your order about the content of the note. Capucinne offers a 5 day money-back guarantee or exchange on all purchases (this excludes items that are custom-made, rushed, discounted, and items on payment/financing plans). Please check our shop policies on more information regarding the terms of return or exchange.